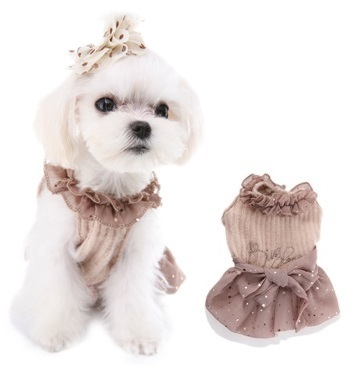 This elegant Puppy Angel Comfy Cocktail Dress combines the comfort of a sweater with the prettiness of a dress. The ribbed sweater body is made from a wool blend with a rhinestone encrusted chiffon neck and skirts. On the back are the words Diva Glam spelled out in crystals and the pretty adjustable belt can be tied to aid fit. Perfect for parties or general pampering!